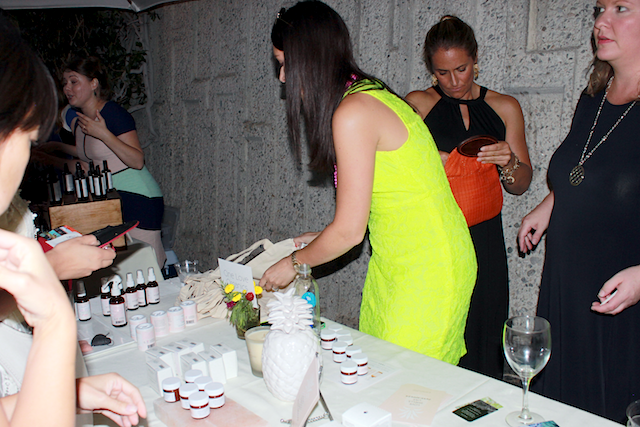 As I mentioned in last week’s posts, I recently flew to Los Angeles to attend A Night For Green Beauty, a special yearly event completely dedicated to Green Beauty. 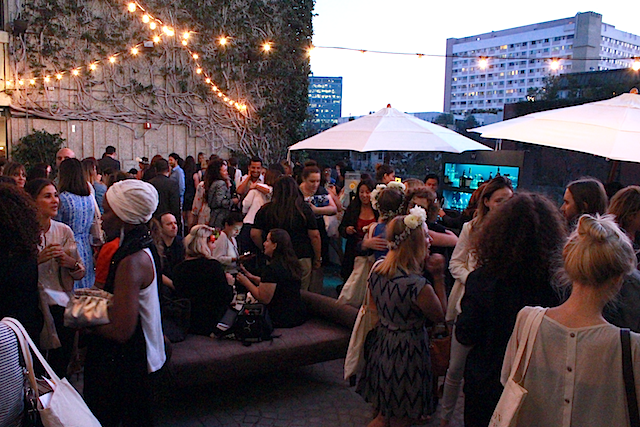 The event took place at the W Hotel in Los Angeles in the beautiful Santa Monica/West Hollywood area. It was my first time visiting the area and I fell completely in love. Nevada was as far West as I had made it before I traveled to LA, so I finally had the opportunity to understand what people meant when they spoke of “the perfect weather” in Southern California. Let me tell you guys, it really is perfect, (and it’s very, very similar to Southern Italy). 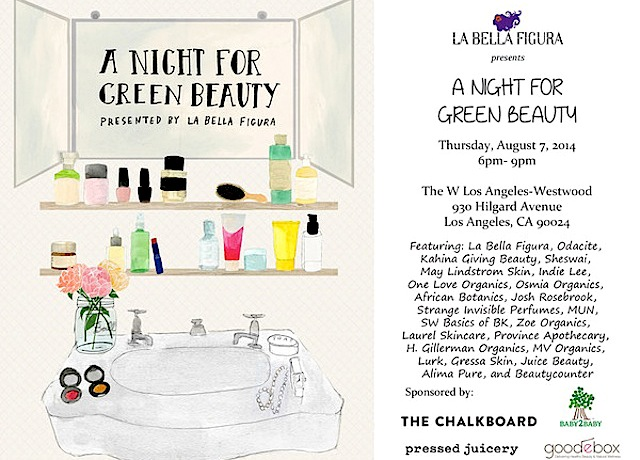 A Night For Green Beauty is hosted by La Bella Figura Beauty, a brand that I have previously featured on GG, (you may recall my raving about their Bio-Healing Face Mask). In addition to their skincare products, La Bella Figura recently launched a makeup line called More Than Makeup that I was able to play with at the event (and I brought some home with me!). 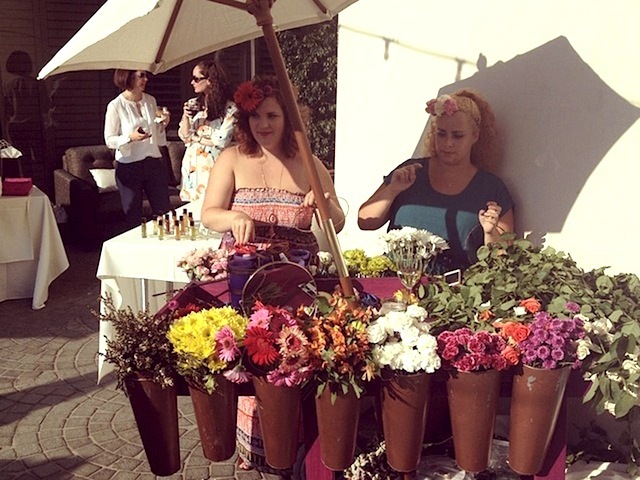 To introduce the new makeup products to the attendees, La Bella Figura had the lovely makeup artist Megan Porschen giving mini-makeovers at the event (you can see Megan at work in the photo below). 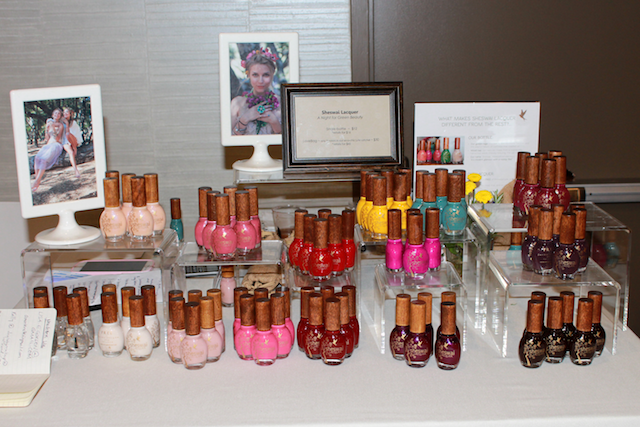 In addition to the makeovers offered by La Bella Figura Beauty, Sheswai Nail Laquer provided a nail bar. I was already wearing one of my favorite Sheswai nail colors, For Real, so I did not take advantage of the Sheswai nail artists, but all of the ladies leaving their seats were absolutely thrilled with their nails! The place was packed. Some stands had people lined up waiting to talk to the company owners and shop. 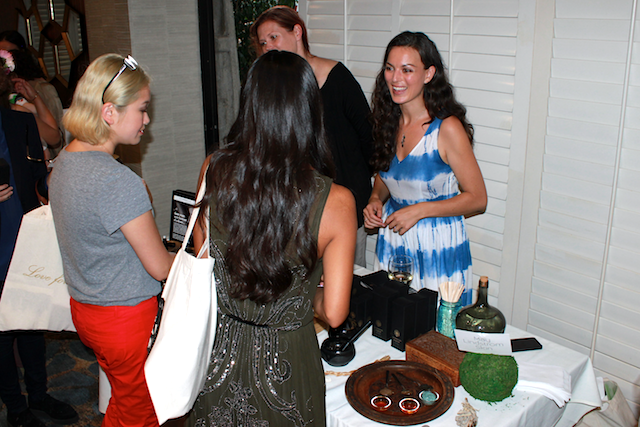 I walked from the May Lindstrom table to the Osmia Organics table and vice versa several times and the lines never got shorter. 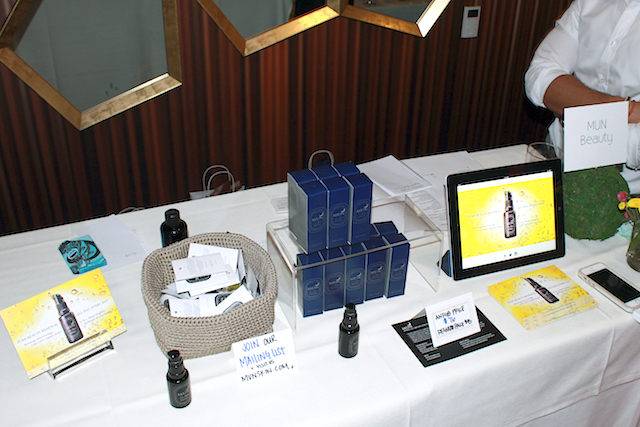 Many of the products were sold out before the event ended. Fresh flower crowns were offered to all participants. The flowers were so gorgeous, and everyone looked so beautiful. I had the opportunity to finally meet and chat with Munemi Imai, founder of Mun Skin and celebrity makeup artist. Not only did I have the best time talking to her because she is a lovely person (and I have been a fan of her makeup work for years! ), but I got to try a new Mun Skin product that will be launching in a few months and felt absolutely amazing. You guys, it’s a t-o-n-e-r! I can hardly contain my excitement because I love toners and I love Mun’s serum. Munemi applied some toner on my hand and followed with a drop of No. 1 Aknari. The combination of the two products felt just perfect, and I cannot wait to try the two products on my face. Make sure to follow Mun Skin on Instagram so you can keep up with the latest from the brand and see a photo of Munemi and myself that I will have to frame and put on my wall. 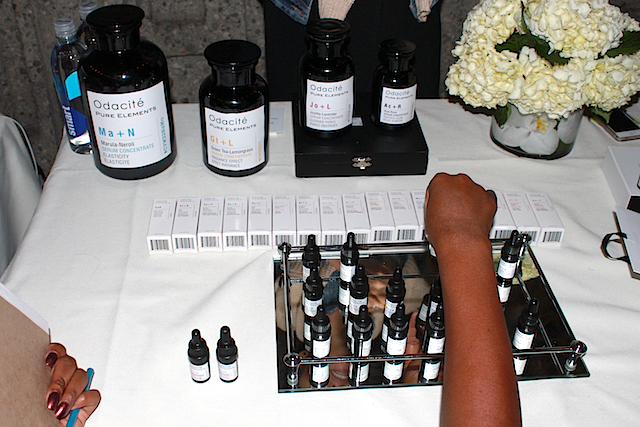 I also had the chance to chat with the founders of Odacité Skincare, Valerie and Romain. I told Valerie that I loved the Serum Concentrate line and that Chamomile had been working so well for my skin, which gets irritated very easily. I asked her which other serum concentrate she recommended for my easily congested skin and she told me that the Peach/Cypress Serum Concentrate should work well for me (keep in mind that Valerie didn’t know that Cypress is my absolute favorite essential oil! That is what my bedroom smells like on any given day). I am definitely going to give that serum a try and let you know how it works, as it is specifically formulated for combination skin. Odacité is also working on new products, but they are still secret, so we will have to wait a little longer while they go through the necessary testing. As you can see in the image below, the ladies at the One Love Organics stand, Elizabeth Dehn and Suzanne Le Roux, were madly busy. Thankfully, I had been able to chat with them at a pre-event brunch hosted by EmbodyBeauty, and I was able to snap a sample of the soon to be launched ED4OLO Body Polish. Man, that stuff is good! La Bella Figura Beauty More Than Makeup – one lip color, a cream blush, a golden-toned highlighter and a cream eye shadow. The cream blush is also lovely on the lips, I absolutely love the texture of it. Osmia Organics Luz Brightening Serum – A brightening facial serum that contains a lot of plant oil that I love. Will have to try it. Alima Pure – I was able to pick up the Fall 2014 eye shadow collection, which is beautiful and I will show you in a separate post. Elizabeth Dehn and One Love Organics brought some testers of the soon to be launched ED4OLO Vitamin C Body Polish, a divinely scented body scrub. I am one of the testers and let me tell you, the stuff is amazing! I think I may have missed some other product launches, but I did not have the time/chance to reach out to all the brands present at the event. Feel free to leave comments below if I missed anything! I wish that I would have been able to take more/better photos at the event, but it was impossible with all of the lovely people that I was able to meet and chat with. People > Photos. I also wanted to thank all of you who tapped my shoulder to say hi. It was awesome to connect with the faces behind the brands and the fellow bloggers, but I was unbelievably flattered to chat with folks who stopped me to say how much they enjoy reading Genuine Glow. I had expected to spend the evening taking photos and shopping, but I ended up spending most of the time hugging, chatting, and laughing. At the end of the event we were all pretty much crawling because our feet were in pain from wearing heels for hours, but it was so worth it. Not sure where the event will take place next year, but trust me when I say that it is one well worth planning for (just make sure to bring some flats). 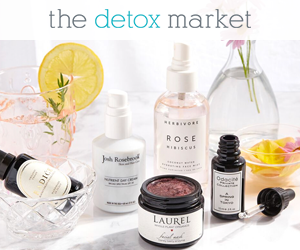 Photo # 3 and #10 courtesy of La Bella Figura, photo #6 courtesy of Instagram @anightforgreenbeauty.